NewTek (Booth SL5016) is showcasing major new software-driven products utilizing the universal power of IP video, giving customers breakthrough capabilities and unprecedented options that seek to transform the video industry. The company is introducing Live Story Creator, unlimited recording, multiple simultaneous aspect-ratio production, and major advances in Premium Access capabilities, VMC software, TriCaster 410 Plus, and Spark Plus converter products that include a 4K model offering customers unprecedented power and ease of use. 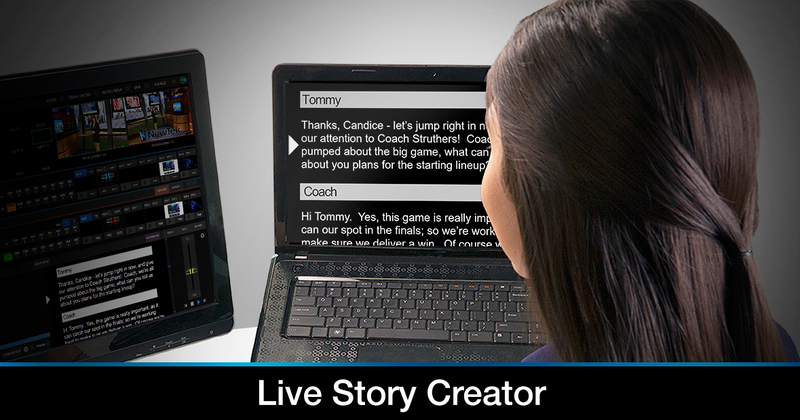 Among new capabilities available with Premium Access for TriCaster, Live Story Creator enables program automation via Microsoft Word. Premium Access is now available to every TriCaster owner delivering incredible power and new tools for TriCaster TC1, the new TriCaster 410 Plus, and VMC, as well as older models in the TriCaster line. Leading the pack of new capabilities is Live Story Creator, a revolutionary approach to program automation using Microsoft Word. It is as simple as building a script in Microsoft Word with triggers for actions; once loaded into TriCaster or VMC, the show is easily executed. The latest version of Premium Access also includes unlimited recording and replay with full synchronization for easy multicam editing, digital-media aspect ratios and frame rates for delivery to digital screens, and much more. The upgrade is free to current subscribers of Premium Access. The full power of NewTek’s VMC1 integrated production system will soon be available as a software-only subscription. As with turnkey VMC systems, the software-only version includes integrated graphics, automation, media playback, recording, streaming, transcoding, and virtual sets, along with all of the benefits of Premium Access. These versatile 4K production software options run on standard workstations and provide the flexibility for system upgrades of CPUs and GPUs as they become available, without the need to repurchase cost-prohibitive proprietary new systems. VMC software will be offered in configurations up to 44-input, 8M/E, allowing users to build an all IP UHD production system. The latest in the lineup of TriCaster integrated production systems, TriCaster 410 Plus provides eight external inputs, 4M/E, four mix outputs, along with NDI integration for video, audio, and data transmission over IP. The rack- mountable system also includes real-time social-media publishing, live streaming, multichannel recording, video playback, integrated multiviewers, graphics, compositing, virtual sets, audio mixing and much more. New Spark Plus models include 4K UHD and 1080p HDMI-to-NDI versions. Adding to the popular line of portable, and affordable NewTek Spark converter products are two new Spark Plus models including 4K UHD and 1080p HDMI-to-NDI versions. Spark Plus captures video directly from connected cameras or devices and allows it to be transported over the network as visually lossless, full-bandwidth NDI with virtually no latency. Spark Plus devices are the smallest, fastest, and easiest way to acquire a 4K UHD or 1080p video source from anywhere on the network and integrate it into IP-based video production. By combining these products with the announced new NDI recording capabilities, these become the world’s easiest multicam capture devices. Live Story Creator, along with many other new capabilities will be included in the NewTek Premium Access software subscription at priced at $99/month, available Q2 2019. The upgrade is free to current subscribers. VMC Software will be available as a software service starting at $795/month. TriCaster 410 Plus will be available in Q2 2019 at $9,995. 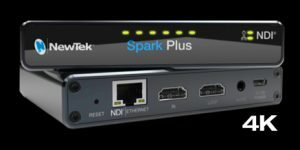 NewTek Spark Plus 4K will be offered at $599. The NewTek Spark Plus 1080p will be $499. Both models are expected to become available in Q2 2019.